Following step-by-step guide helps you to use the Azure template “SharePoint server farm” though you have a Azure free trial account. Microsoft offers a free trial account with $200 credit that lets you evaluate Azure for a month. But it seems like you can’t use the Azure template SharePoint server farm when you have a trial account. Well you can use it – I found a way that I want to share with you. Only with ARM it is possible to use a Azure template (ARM template). Of course the second model is considerably more faster and would be the favorite one. 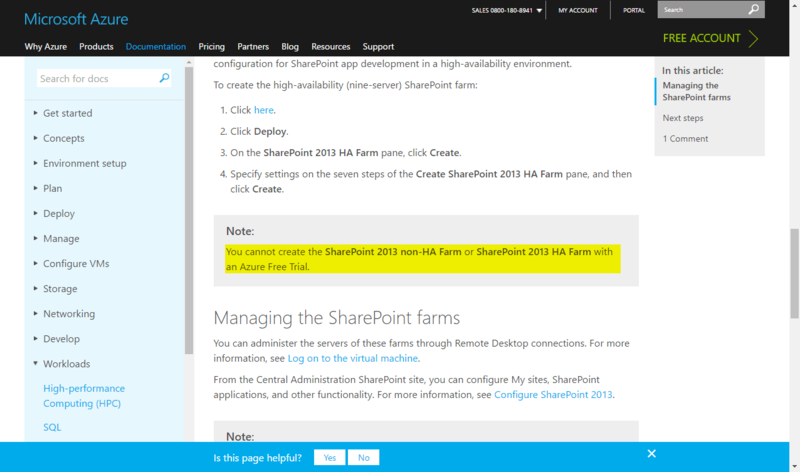 After the preparation was done it took about 30 Minutes to deploy a complete SharePoint three tier small farm! You can find a lot of guides for the classic deployment (see link list at the end of this post), but nearly no information about the second one. Microsoft states, that you can’t use SharePoint server farm templatess with a trial account, see following screenshot of the Microsoft page Create SharePoint server farms. Just use following Step-by-Step guide.